ROWLETT — Alexis Bortell is the unlikely face of a controversial issue. 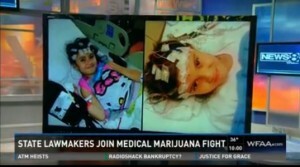 "Medical cannabis will help me," said the nine-year-old girl. "It's illegal in Texas, and we're trying to change that." Her story has attracted attention across Texas. Two Republican lawmakers recently introduced legislation to legalize medical marijuana — not the kind you smoke, but rather cannabis oil. "It will help reduce my seizures," Alexis explained. They strike about twice a week. Her seizures aren't violent, but are still serious, and made more so because drugs won't help. "This may or may not work, but it hurts to know that there's something out there that could help her and we can't get access to it because of our ZIP code," said Dean Bortell, Alexis' father. "We kind of feel like we failed her." Alexis can't ride a bicycle, can't sleep over with friends or many other things nine-year-old girls do at this age. An adult who can administer her emergency medicine always has to be around in case she has a seizure and collapses. The Texas bill, sponsored by State Sen. Kevin Eltife (R-District 1) and State Rep. Stephanie Klick (R-District 91), is a good start, Dean said, but it doesn't go far enough. If passed in its original form, the Texas Department of Public Safety would regulate use of the substance rather than the Department of State Health Services. In addition, the first doses wouldn't begin until 2018, and patients would first have to undergo all medical procedures before being eligible for cannabis oil containing low-THC.